Add the oil to the pan then brown the meat in the oil, then add the tomato sauce and season with salt and pepper. Peel and cook the potatoes, then mash them with the chopped parsley and salt and pepper. 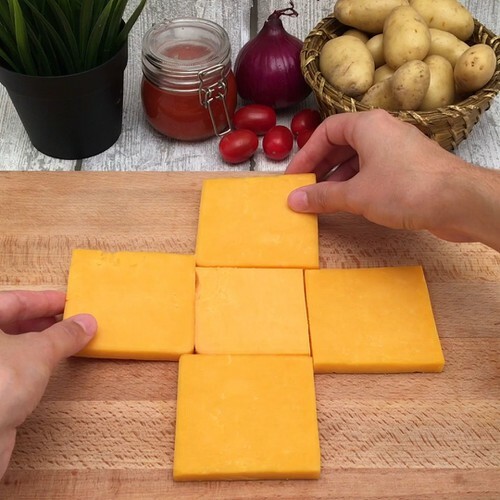 Use toothpicks to make and hold together a cube of cheese, then fill the cubes with layers of the meat and potato mixture. Place the cubes in the freezer to harden for 30 minutes. Remove the toothpicks, and coat the cube in flour, beaten egg and breadcrumbs. Then fry in hot oil until the breadcrumbs are golden brown. Serve with salad on the side.